PIPDIC is having 6 industrial estates and an IT Park. · Mettupalayam Industrial Estate, Puducherry (167) acres. 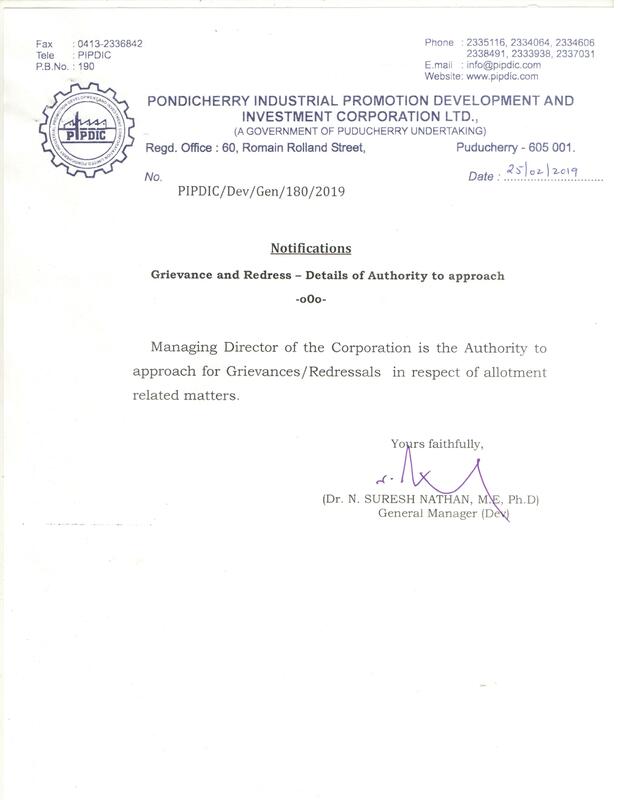 · Sedarapet Industrial Estate, Puducherry (62 acres). · Kirumambakkam Industrial Estate, Puducherry (23 acres). · Thirubuvanai Industrial Estate, Puducherry (52 acres). · Industrial Growth Centre, Polagam, Karaikal (597 acres). 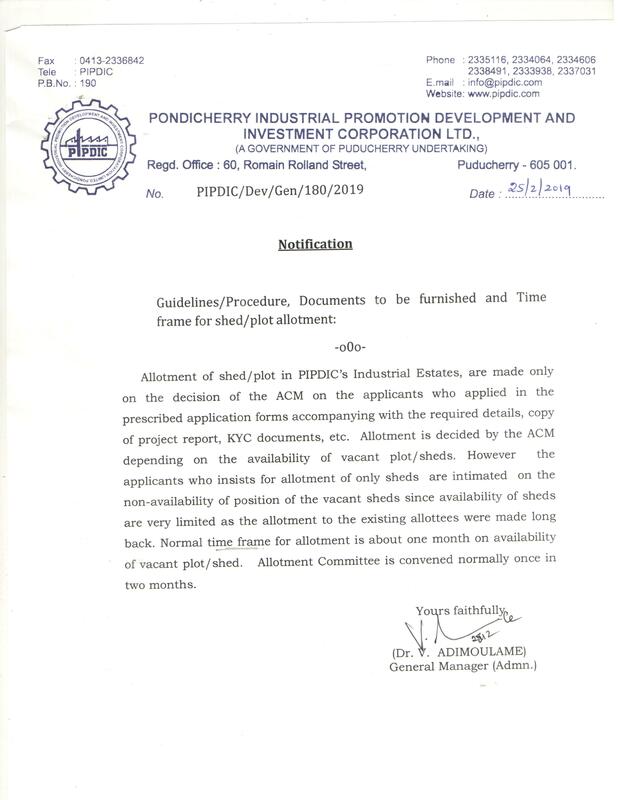 · IT Park, Pillaichavady, Puducherry (3.16 acres). Allotment of land/plots/sheds/Ready Built Factory (RBF) buildings are made subject to availability on terms & conditions. Applications for allotment of land / plots / sheds / Ready Built Factory (RBF) buildings should be made in the prescribed form available at the corporation on payment of Rs.500/- (Rupees five hundred only) or download from this website. If the application forms are downloaded from the website, the filled application forms can be sent along with requisite price of the form by way of D.D in Indian currency or its equivalent foreign currency. Guidelines / Procedure, Documents to be furnished and Time fame for shed/plot allotment. 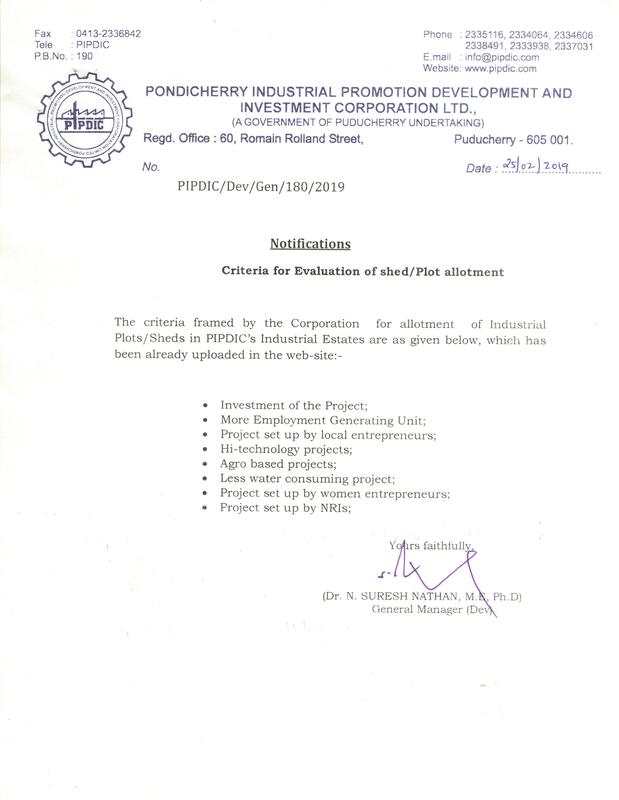 Inviting Applications for Allotment of developed (or) Un-developed Plots at Industrial Growth Centre, Polagam, Karaikal.